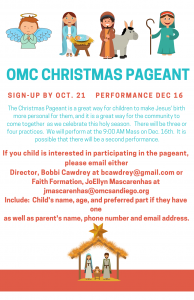 Our Mother of Confidence Sign up Your child for the Christmas Pageant by October 21st! Our Mother of Confidence > News > Community > Sign up Your child for the Christmas Pageant by October 21st! The OMC Christmas Pageant will be on December 16th at the 9 am Mass this year. If your child is interested in participating in the pageant, please sign up by October 21st. The total commitment will be about 3-4 practices, and then the actual pageant on the 16th. Consider how wonderful it will be for your child to participate in one of our sweetest OMC traditions. Please email either the director, Bobbi Cawdrey at bcawdrey@gmail.com or the director of Faith Formation, JoEllyn Mascarenhas at jmascarenhas@omcsandiego.org.